We recently saw Steve Jobs unveiling the much rumoured and long-awaited Apple tablet device which has been announced as the iPad – and that’s just where the opinions start. Some people think that the iPad name makes sense, keeps in line with the iPod branding, but leaves it open to lots of different uses, whilst others think it’s now a bland name and uninspiring. This tablet device will come in mobile broadband internet and Wifi-only versions with different amounts of storage capacities, all of which will have an impressive battery-life of around 10 hours, including while browsing the web or playing HD video, so this could well replace many people’s need for a netbook computer, especially when travelling or sat on the sofa at home. The iPad itself is no real revolution, it’s more of an evolution as it’s essentially an enlarged iPod Touch which a 9.7″ screen that runs a modified version of the iPhone operating system with wifi or 3G options available. What that also means is that current contents of the Apple App Store (all 140,000 apps) are able to run on this device straight away, with developers now being able to create specific iPad apps. One of the main uses of the iPad looks to be as an eBook reader, which even includes a great way of moving pages, you literally flick between them like a book – is this the end of the buying the Kindle 2 in the UK, Europe and everywhere else?? You’ve also got to wonder about the timing of recently being able to buy a Kindle DX in the UK and Europe? Did Amazon see this coming and wanted to cash in on their e-book reader product while they still could? 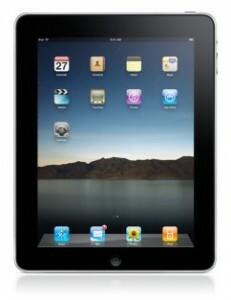 The big question everyone must be asking is whether the Apple iPad will be the stylish netbook and Kindle replacement? Or is it a product trying to solve a problem that doesn’t exist? Other than giving Apple fanboys another product to eagerly spend their money on? If you want a device that is this kind of size, wouldn’t you prefer to not be locked into the “Apple App Store Ecosystem” and for the same kind of money just get one of the best netbooks out there which would allow you to do more? Along with the Apple iPad, comes a whole host more opportunities and possibilities, there’s lots more to find out about this tablet device yet with many people having an opinion, do you think this type of tablet device is going to change the way we do things in all walks of life? Or do we not really need an iPad tablet device?